Yarn: Red Heart with Love 7 oz (198 g) and 370 yds (338 m). 100% acrylic. Medium Weight Yarn . Machine wash warm, gentle cycle. Tumble dry low. Do not over dry. Finished Project Yardage: Adult: g / yds for sample size (Child). See sizes listed in the pattern below. Back Bump of the Chain. The following image shows where the back bump of the chain is located. Working into this loop gives your project more stretch. For this pattern we will work dc stitches into the back bump. The image is taken from another free pattern where we worked sc stitches instead. 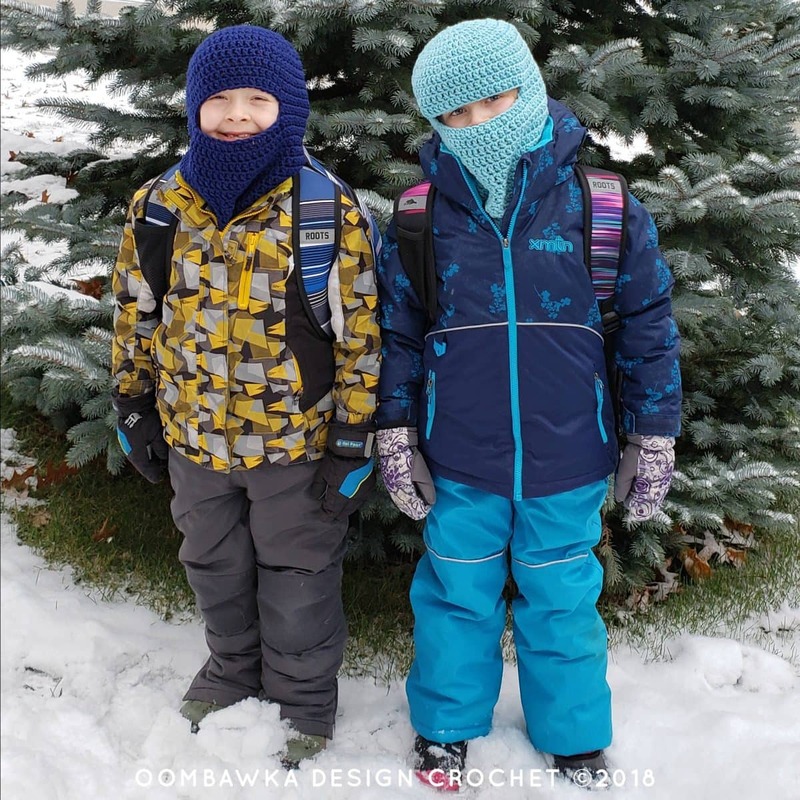 My children prefer and are wearing the longer version of the winter ski mask. They like to have the extra fabric to tuck into the neck of their jackets to keep them super warm and snuggly. I have included a shorter version option which will fall above the neckline of the jacket, in the instructions below. 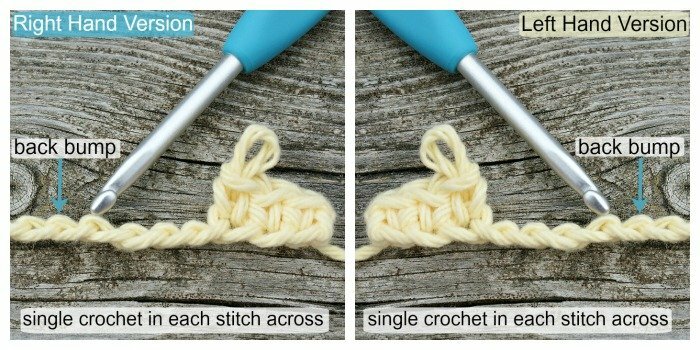 For any of my hat patterns that I have started with a double magic ring (see this tutorial) you can just as easily crochet a regular magic ring or begin by crocheting a chain-3 and slip stitch to join to the first chain to form a ring and then work your stitches directly into that ring. Finished hat size: 16″ circumference. To fit 18″ head size. *For the short version stop after R15*. Finished hat size: 17″ circumference. To fit 19″ head size. *For the short version stop after R16*. Finished hat size: 18″ circumference. To fit 20″ head size. *For the short version stop after R19*. Finished hat size: 19″ circumference. To fit 21″ head size. *For the short version stop after R20*. 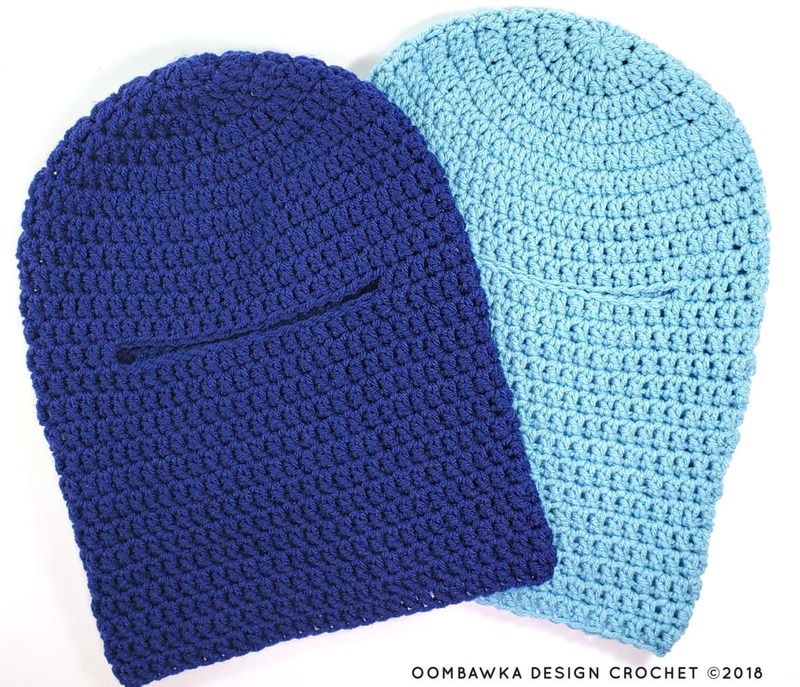 Finished hat size: 20″ circumference. To fit 22″ head size. *For the short version stop after R24*. Finished hat size: 21″ circumference. To fit 23″ head size. *For the short version stop after R25*. *For the short version stop after R26*. Merci beaucoup, je trouve ce modèle très pratique. Thanks for reply. I tried that back stitch dc on those 20 chain at least 5 times and it was so difficult. However I am almost done but seem to have lost one stitch somewhere in that round. I will try another hat. This one made for 12 months. Are all the dc done in back bump or just the dc in the chain? This looks like the perfect hat for kids who love to play outside. They can stay out longer and Mom doesn’t have to worry about their faces. I can also see grown men shoveling snow with less fear of frostbite to their faces. I am definitely going to make some for our “Hat and Mitten ( we have added socks) Tree” at church to give to children and adults who need them.